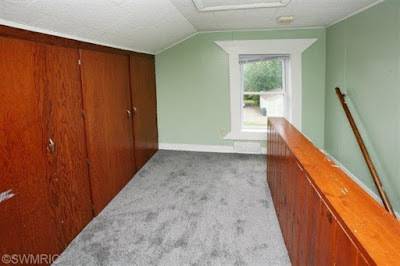 Stairwell and hallway project: before pics | House Unseen. Life Unscripted. You know how everything looks truly terrible right before it starts looking great? I remember on the day of my prom, I looked HORRIBLE right before I really started getting ready. Because it's not like you get ready first in the morning and then get ready again at night, know what I'm sayin'? Okay, well *I* didn't do that sort of thing because Kurt Cobain and flannel. Things looking terrible, yes. So my house is actually not horrible, but I like to start projects and then take pictures of the shambles I've created and call them before pics so you think "why did she buy such a horrible house? It's weird! But dang that after picture is the bomb." Yes, you still say "the bomb." It's cool. Right now I'd prefer to be switching the kids' rooms around to make a big girls' room and a small boys' room but due to circumstances beyond my control (where in the sam heck is the hardware to re-bunk those bunk beds? PROJECT ON INFINITE PAUSE. HOLD ME, JESUS.) but since I can't I decided to tackle the stairwell and hallway that leads from the downstairs to said bedrooms. It's a wreck up there right now, y'all. Wanna see some before pics? Wait, I never showed you the LIVING ROOM did I? I'm so behind! We'll get to that, we'll get to that. Focus. Anyway, lemme just talk about the situation here for a minute. 4) weird pointy things on the top and bottom of the window trim. Is that the Vulcan of the window world or something? Why? 5) crooked horizontal blinds. Not an architectural detail but I'm just questioning the lack of time to fix that before snapping this shot. Not that I'm complaining! This sort of thing probably prevented a good many people from coming and seeing this paradisaical property so we totally lucked out but still. Still. So! The carpet has to stay. Despite its color, it is brand new and I have no idea what's happening underneath there which is Czech for "mo' money, mo' problems." That leaves us with the walls, the wood and the window to tackle. This post brought to you by the letter W.
Oh that poor light fixture. I want to love it because it's all old and stuff but I really can't. It's just so ugly and covered in paint splatters. I'll see if I can get a better shot. Preeeeeeeeeetty sure that's gonna need to go bye bye. Okay! Now for the mess I've created! T removing the pointy things of questionableness. This is when it started getting REALLY ugly up there. You can see the half way in the foreground with primer on it (exciting!) and if you want to see a couple more detail shots, including one of what that wallpaper looks like under those triangles, you can hop over to the Instagram and take a gander. Whew. I'm excited to get this finished and my kids are probs pretty excited to not have to tiptoe around drop cloths to get towels out of the linen closet. Bless them, bless them. That door at the bottom of the steps! Tell me it's going away?! Yay! I love before and afters! I can't wait to see the new wall color! I really can't believe how much you get accomplished while pregnant. I mean, I know you are feeling better, but wow. I am excited to see the finished product! That wood was ril ril ugly. And I normally like wood. 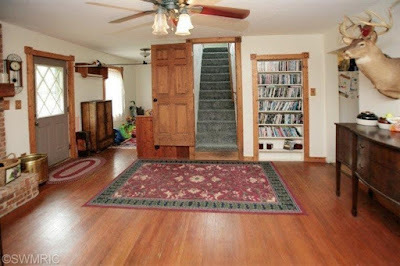 I still vote for making that door at the bottom of the staircase a Dutch door, which would make an awesome baby gate. I live in a fixer-upper as well so I love posts like this. We're working on our stairwell too! And yes, we have different shades of wood everywhere--must be an 80's thing???? I will be checking to see the "after!"